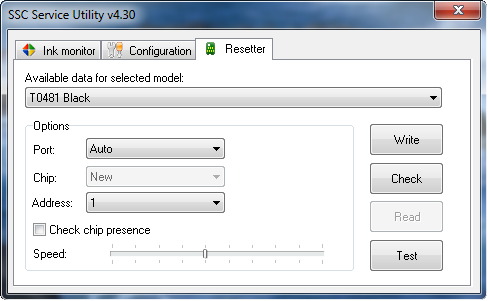 SSC Service Utility ver.4.30 (sscserve.exe v 4.30) now available to download. This newest version of SSC serve (also called as SSCLG software) has supported more than 100 Epson printers models but it still does not support for Epson C79 and C90 and newest version of Epson. This software allow user to reset the counter on the printer, reset chip cartridges on most epson printer models, cleaning color and black heads cartridge, freeze the counter on the printer and more function. SSCServe.exe v 4.30 works and support for following Windows Operating system; Windows 95, windows 98, windows ME, windows 2K2, windows XP, windows 7 and support the Epson printer that connected through both the LPT and USB printers connection. Reset and Freeze internal ink counters on the Epson printers. 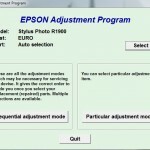 With powerful cleaning mode this software can separate cleaning of color and black heads for all Epson inkjet printers. 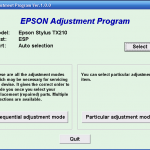 SSC Service Utility for Epson Stylus Printers Versions 4.30 is free software. So everyone can use this software for free. 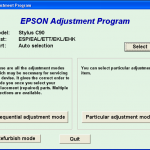 Select your epson printers type if Your printer is unsupported, if no I suggest you to use adjustment program resetter (adjprog.exe) for printer epson. you can search in Google use keyword “adjustment program” or “adjprog.exe”. You can be accessed by right clicking on the application icon located in tray. Related to "SSC Service Utility Versions 4.30 (sscserve.exe v 4.30) Available to Download"
I did the print test: yellow was missing, black-cyan-magenta were ok. I started the automatic cleaning from the utility panel. Through the following print tests, yellow lines started to show where there was first only magenta. In the end there was just a thick beautiful yellow bar in the default place for magenta, and no magenta anymore. Nothing printed in the default place for yellow, while black and blue bars were still ok.
More cleaning utility -> striped colors (no yellow). I can’t see what happens. It makes no sense to me that colors exchange place when I do the print test. I swear I didn’t take drugs or such things. It looks weird enough, besides, that after the cleaning the print is striped, when before the cleaning it is not. We also tried SSC software, but didn’t help. Im need a Epson Tx105 Reset…. hi can any body help me… i have a problem on my printer epson stylus c59 parts inside are end of service life.. please help me if anybody have solution for that, i already use ssc.. but didn’t work…… heres my email eVeXeOn@yahoo.com thank you so mch.. I need a resetter for EPSON T11. I think SSC cant support T11. please help me a link to download service software for T11. Fauzan can you help me to reset my epson t10? it’s say your printer is end of life…. please can you help me……..
Fauzan, good day! do you have any software or tips how to reset ink level of canon ip1980 ink cartridge.. I have the epson stylus cx1500. How can I reset please? I have a an Epson Stylus Photo 820 that has given me a service message which is the waste ink counter is at the end of its counting. My computer is a Mac using OS X 10.5.8. Is there any software out there for Macs that will reset the waste in counter? Every SSC service utility I see is for PC. Any help would be appreciated. i have t11 so tell me how reset it ? Can you help? I’m wasting so much money on ink, and I can hear it splashing around inside the cartridge. i already installed ssc service utility and adjustment program for my epson c58,but cant reset my ink pad counter.there some errors. Device not found. The only reading I can get. Unable to print using DX4850 since installing SSC. Ink cartridges not recognised. Can you help please? because SSC doesn’t support it DX8400. ink cartridges T0711/H0711, T0712, T0713, T0714 (they’re not listed in the drop-down list). Is there another way to reset the DX8400 chips? hi . i have epson cx6900f printer . i need service requires . please help me . help … thanks. Vi el documental sobre la obsolescencia, me pareció muy interesante y a la vez educativo. Translated: I saw the documentary about obsolescence, I found very interesting and educational time. 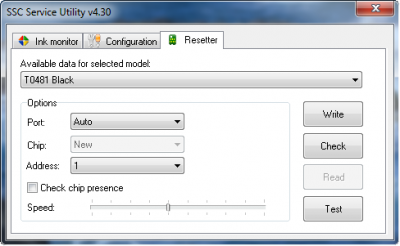 Hi – do you have the site for SSC utility for a Mac OS 10.6? hi i have epson t50 and i install sscserve on my pc and run it.but i cannot find t50 in dropdown list in sscserve. can you help me that i reset my printer?